State Sen. Daniel Biss (D-Evanston) speaks at a town hall on Tuesday. Biss told The Daily he was considering a gubernatorial bid at a panel event Wednesday. State Sen. Daniel Biss (D-Evanston) told The Daily on Wednesday night that he was considering a gubernatorial bid next year, but had not yet reached a decision. There are currently a handful of declared candidates, including current Gov. Bruce Rauner and Ald. Ameya Pawar of Chicago. 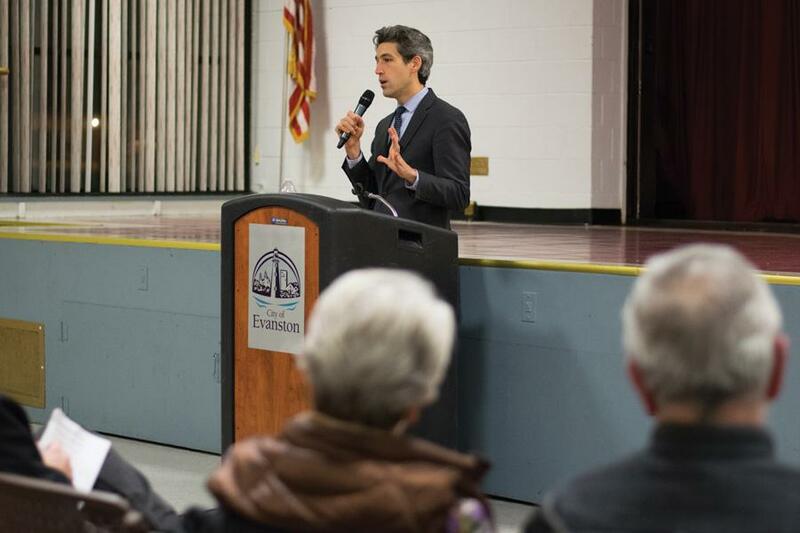 Biss mentioned the potential of a bid while attending a “Community Action” panel at SPACE — a concert venue in Evanston — to discuss plans for the next four years under a Trump administration. Also in attendance were U.S. Rep. Jan Schakowsky (D-Ill.), Medill Prof. Peter Slevin and Colleen Connell, executive director of the American Civil Liberties Union in Illinois. The Women’s March on Washington — a grassroots effort started by a national coordinating committee — is a response to rhetoric that “demonized” people of color, LGBTQ individuals, Muslim Americans and immigrant communities during the election cycle, according to the organization’s website. More than 200 Evanston residents plan on traveling to Washington to participate in the march. Throughout the evening, panel members shared advice on how to stay involved and get in touch with their local representatives. “Remember, there are more of us than there are of them,” Connell said, referring to the majority of voters who did not choose President-elect Donald Trump. Connell encouraged the audience to mobilize and make themselves heard by joining advocacy groups. She also stressed not abandoning officials who come to compromises or settlements to pass legislation. But one politician received little sympathy from the panel. Biss criticized Gov. Bruce Rauner’s agenda and said state legislation may be “the last line of defense” when it comes to the new presidential administration’s overturn of existing policies. Last week, Congress passed a first step toward repealing the Affordable Care Act, a sweeping health care law that has provided coverage to millions of Americans. Though many politicians have voiced their support or opposition to repealing the law, Rauner has remained largely silent. Biss said Rauner’s indifference stemmed from a major investment income tax that in 2015 cost the governor about $7.1 million. He asked the crowd to advocate for state laws and ordinances like those that designate Evanston and Chicago as sanctuary cities.